A new touring exhibition will open at Ferens Art Gallery, Hull on Saturday 4 May. Is This Planet Earth? features curious life-forms and strange landscapes created by nine artists. In their sculptures, paintings, sound-art, performance art and videos, every colour and sensation is heightened – and it is all a bit sci-fi. What if life on earth has become just a memory? What if these artists’ re-creations of nature are now the only way of experiencing it? This exhibition is presented as an offering to aliens who visit us in the future. Instead of seeing nature in reality, this is what they encounter. In oil paintings by Katherine Reekie, we see weird and wonderful creatures, many combining children’s TV characters and animal and vegetable DNA. Halina Dominska has sculpted large-scale plant-life that ‘breathes’ as visitors approach. Salvatore Arancio presents lushly coloured ceramic sculptures of mossy growth and fungal flesh. Dazzling paintings by Dan Hays conjure up entirely virtual, pixilated landscapes. There are the sounds of hedgerow birds, croaking frogs and an owl’s cries created using the artist Jason Singh’s own voice, beatbox-style. Helen Sear’s video of wood has been digitally warped and is projected onto the floor: it becomes a teeming pool of luminous life that visitors can walk through and bathe themselves in. Seán Vicary animates footage he shot on a sunny day by the sea: a space-ship-like seashell hovers over the cliffs and a limpet shell seems to be signalling to us. Sculptor Alfie Strong provides a pile of tapestry-covered cushions for us to sit on, with images of rockpools with blood-red shadows and water that is the darkest navy. Performance artist Patrick Coyle, who grew up in Hull, will conduct a tour of the city, called ‘Kingstupon Hull Stumption’, which is set in the future. The Humber Estuary glows a luminescent brown and water has become a luxury item. Using a futuristic yet local language, the artist will explain how the people of Hull have adapted. The date and time of Patrick’s performance is to be confirmed nearer the time. Inspired by Is This Planet Earth? 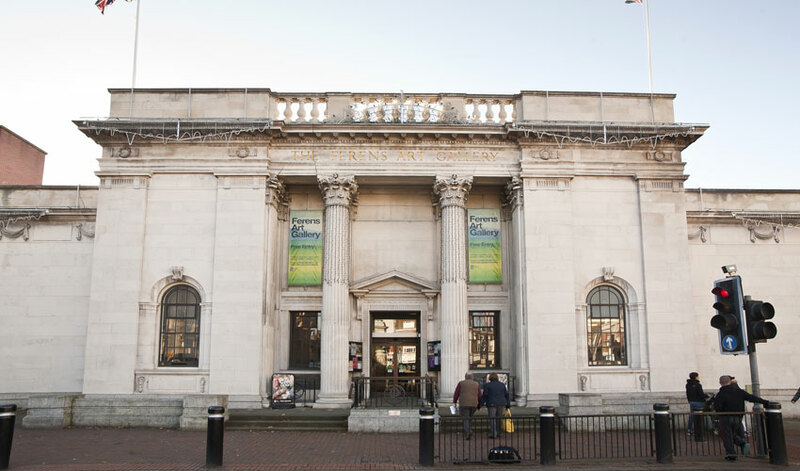 Ferens Art Gallery has delved deep into the Hull Museums Collections and uncovered gigantic insect specimens and breathtakingly ornate seashells. Demonstrating that real life can be just as strange as fiction, these insects and shells will be put on display alongside the artworks. This free exhibition will run from 4 May to 28 July 2019 in galleries 7 and 8. The Gallery is open Monday – Saturday, 10am – 4.30pm, and Sunday, 11am – 4pm.